GRENFELL, CAPT. 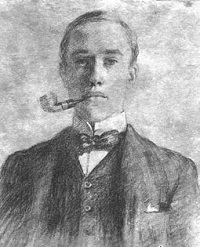 FRANCIS HENRY (1874 - 1946), naval officer, was born in 1874, the eldest son of Capt. Hubert Henry Grenfell RN and his wife, Eleanor Kate Cunningham. Grenfell was descended from an old naval family, as in addition to his father, his grandfather, HDP Cunningham, and two of his great-grandfathers having been naval officers and his brother was Capt. Russell Grenfell a noted author on naval subjects. His other grandfather, Rev Algernon Sidney Grenfell was a schoolmaster at Rugby School. He entered the Britannia in 1898, and was one of the last officers to do a foreign commission under sail. In 1903, when the Admiralty felt it necessary to replace the activity formerly provided by the work aloft by some form of physical training, Grenfell was selected to be first lieutenant of the newly created Physical Training School at Portsmouth during its initial two years. So enthusiastic did Grenfell become about the Swedish system, which formed the basis of the training, that on the completion of his appointment he, with Lieutenant Bernard Coote, retired from the Navy to undertake the introduction of the Swedish system in the public schools, during which time he spent some time at Eton College. Their work becoming known, Grenfell was asked in 1909 to join the Board of Education to bring his knowledge for the benefit of the State-aided schools. In 1914 he was recalled to the Navy, and after a year as second in command of the armed merchant cruiser Cedric, he volunteered for Q ships and was given command of the Penshurst. In her he proved himself one of the most successful of the Q ship captains, the Penshurst accounting for two enemy submarines, UB17 and UB39, as well as having actions with several others. For these services Grenfell was specially promoted to captain on the retired list and decorated with the D.S.O. and Bar and the French Croix de Guerre. Returning to the Board of Education after the 1914-18 war, he was given charge of the Board's physical training section and served in that capacity until he retired 16 years later. Francis Grenfell was a man of many interests. He was a keen mountaineer, both in the Alps and on the Welsh and Cumberland mountains, and was also a lover of music and art, especially of modern etchings, of which he at one time had a noteworthy collection. On retirement at the age of 60 he began training as a sculptor at the London Polytechnic, and within 18 months had his work accepted for the Royal Academy. Capt. Grenfell died on 29 April 1946. Obituary in The Times May 22nd 1946, Frank Grenfell. Portrait of Francis Grenfell, aged 20, by his sister Florence, is in the possession of his nephew, Frank Grenfell.